Kumbh Mela is one of the most spiritual, auspicious and mesmerizing events across the globe. It is a prime ancient northern Indian festival where millions of spiritual and mystic minds meet and be a part of the largest religious gathering. The devout and learned saints and sadhus gather at one place in order to discuss spirituality, religion and several divine aspects of human life. The Ultimate Feel Of Spirituality, Religion And Mystic Powers"
Kumbha represents a ‘pot’ or a ‘pitcher’ which signifies the life of a human being or the human body. The physical body is made up of clay and is fragile in nature. It is believed that the human body must be heated in the divine flames of yoga and must be poured with nectar like devotion, spirituality, and love. In this way, the humans can be a true part of the Kumbh Mela and can attain a step closer to salvation. The name Kumbh derived its existence from the mythological history and legend associated with the immortal pot (Kumbha) of Nectar. As per the Puranas or the Vedic scriptures, both the Demons and the Demigods were fighting for acquiring the immortal pot of Nectar. The Devtas (Demigods) became weak because of the strenuous curse and therefore in order to regain their powers, it was suggested by Lord Brahma to churn the ocean and get the nectar. But because of the malefic effects of the curse, the demigods were unable to churn the ocean alone. They formed a mutual agreement with the demons to complete the sturdy task and in return, they agreed to share half of the nectar with them. Both demigods and demons gathered at the shore to churn the ocean. 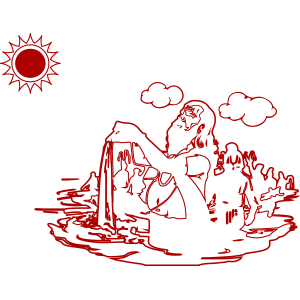 Several deities help in the process of churning the milk ocean (Samudra Manthan). Vasuki who was the king of all serpents took the form of a rope to accomplish the task of churning. The Mandara Mountain was used as the churning rod. The poison which came from the churning procedure was consumed by Lord Shiva to save the earth and all the species living on the planet. Lord Vishnu took the form of a giant tortoise who supported the mountain to stay firm. After great penance and efforts, Dhanwantari came out from the churning process with the pot of Nectar. The Demigods were fearful about the negative outcomes if demons drank the nectar. So, they seized the pot of nectar and kept it safely within the protective shield of Lord Chandra, Lord Shani, Lord Surya, and Lord Brihaspati. When the demons get to know about it, they went behind all the demigods in search of nectar and the chase lasted for a period of 12 nights and 12 complete days. There were a number of fights that took place between both of them. As per the historical and ancient beliefs, during the chase, few drops of the nectar fell from the Kumbha (pot) at particularly four places that includes Nasik, Allahabad (Prayag), Ujjain, and Haridwar. Since that time, these four regions are believed to have some spiritual and mystical powers. As the chase went for a period of 12 days which is regarded as 12 years in human life, the Kumbh Mela is supposed to take place once in a period of 12 years. But the festivity is celebrated 4 times in the total period of 12 years. The reason being that the drops were fell down at all those four places and thus the site of the grand observance keeps on rotating among the 4 pilgrimages on the shore of sacred rivers. The celebrations are held on the shore of Shipra Nadi in Ujjain, on the shore of Ganges river in Haridwar, on the shore of Godavari Nadi in Nasik and at the confluence of Saraswati, Ganga and Yamuna in Allahabad (Prayag). Millions of devotees took part in the celebration by participating in the rituals, bathing ceremony and other sacred acts to eliminate all their past and present sins. A lot of rituals and ceremonies are held during the Kumbh festival which comprises one of the most sacred rituals i.e. the bathing ceremony (popularly known as ‘Kumbh Snan’). It is regarded as the most vital and significant rituals in which millions of pilgrims partake. As per the legend and scriptures, Lord Brahma stated that by taking a holy dip in the sacred river one can get relieved from all his past and present sins as well as it can help in the individuals and their ancestors to attain salvation by getting free from the cycle of birth and death. It is believed that it takes one a step closer to the path of Moksha (salvation). By submerging in the water on the sacred days of Kumbh starting from the eve of Makar Sankranti is regarded as an extremely beneficial and holy day for taking the bath. Similarly, for the Kumbh Snan, few days of the Kumbha festival are considered even more sacred and auspicious. The Kumbh Snan starts with the ‘Rajyogi Snan’ or ‘Shahi Snan’ which is the key feature of Kumbh Mela and entire celebrations. In the Shahi Snan, the saints, as well as all their disciples, take a holy bath at some specific time period in order to commence with the celebrations of the Kumbh Mela. In the Rajyogi Snan, the ascetics are offered priority and once these people initiate with the Snan, the common people are permitted to take a holy dip. It is regarded as the biggest Kumbh Mela which is usually a once in a lifetime festivity for Hindus. Literally, the Maha Kumbh Mela takes places once in a total period of 144 years (after completing 12 Purna Kumbh Melas). This type of Kumbh Mela takes place only in Allahabad (Prayag). The last Maha Kumbh Mela that took place was in the year 2013 and now the next will take place after a period of 144 years. It is regarded as the second largest and biggest Kumbh Mela which takes place after completing a period of twelve years. In the holy rituals and ceremonies, millions of people participate and take a dip in holy Sangam. The last Purna Kumbh Mela took place in the year 2013. Literally, ‘Ardh’ signifies ‘half and the term ‘Mela’ represents a fair. Hence, the Ardh Kumbh Mela denotes the type of Kumbh Ka Mela which is celebrated in a period of every six years. This type of Kumbh Mela takes place only in Haridwar and Allahabad. The Kumbh Mela festival is celebrated at 4 specific places comprising Nasik, Ujjain, Haridwar, and Allahabad. The Kumbh Mela is organized on a higher level with great fervor. Devotees come and take a holy bath during the Kumbh Mela. The Magh Kumbh Mela is also popular as Mini Kumbh Mela which is vital and significant for Hindus as it is regarded as the day when the Universe was created. The celebrations of Magh Mela is held every year on the banks of the confluence of Saraswati, Yamuna, and the Ganges usually called as Triveni Sangam. According to its name, it is celebrated in the Magh month of Hindu calendar. The Kumbh Mela takes place in Nasik when the planetary positions show that the Jupiter and the Sun are in the Leo sign during the Bhadrapada month as per Hindu calendar. The Kumbh Mela take place in Haridwar when the planetary positions show that planet Jupiter has its placement in Aquarius and the Sun is in Aries during the Chaitra month according to the Hindu calendar. The Kumbh Mela take place in Ujjain when the planetary positions show that planet Jupiter has its placement in Leo and the Sun is in Aries or the Moon, the Sun and Jupiter, all of the three are in Libra during the Vaisakha month according to the Hindu calendar. The Kumbh Mela take place in modern Allahabad (Prayag) when the planetary positions show that the Moon and the Sun have their placement in Capricorn and Jupiter is in Aries during the Magha month according to the Hindu calendar. The first one are the ‘Nagas’ who are regarded as the naked saints who usually smear their complete body with ash and also have long and knotty hair. Because of the continuous exposure to the diverse weather conditions they develop themselves as resistant to the severe extremities of the temperature. Due to the regular smoking of weed, their eyes look bloodshot. The second one is the ‘Urdhwavahurs’ who have a skinny appearance because of constant penance and spiritual practices. The third one is ‘Parivajakas’ who remain silent as they practice the vow of silence. The fourth one is ‘Shirshasana’, such sadhus remain standing, meditate by standing on the heads and even sleep with their heads in a vertical position. The fifth and the last one is the ‘Kalpvasis’, such sadhus who usually stand and remain near the banks of the holy rivers to meditate and perform various rituals. The most significant and important ritual of Kumbh Mela is the bathing ceremony or the Kumbh Snan. The ritual is performed to purify one's soul and body. The pilgrims perform the ritual of taking a dip in the holy water right from the time of 3 o’clock in the morning. Huge lines of devotees and pilgrims are formed to perform the ritual. Other rituals and ceremonies comprise singing of the devotional songs, having debates on the religious doctrines, mass feeding to the poor and needy and having religious assemblies. In a fixed order, the pilgrims take the holy bath. The first one who enters the holy rivers is the ‘Nagas’ Sadhus as they are not inclined towards material possessions. Then they are followed by other Sadhus i.e. Urdhwavahurs, Parivajakas, Shirshasana, and Kalpvasis. After that other pilgrims can take the holy bath. After concluding with the bathing ceremony, the pilgrims go to worship on the banks of the rivers in fresh clothes. The pilgrims then focus on their spiritual enlightenment and thus listen to the several discourses from various learned Sadhus. “World's Largest Congregation Of Religious Pilgrims"
The Maha Kumbha Mela has been billed as the "world’s largest congregation of religious pilgrims". It is one of the most ancient and religious festivals which was attended by approximately 100 million pilgrims in the year 2013. It is a festivity which is deep-rooted in the religion, culture, and values of Hindus and is celebrated across India. The event was regarded as the largest peaceful gathering when it was held in Allahabad (Prayag). Be a part of this divine and mystic event and attain a lifetime spiritual experience!